Would you give $5.25 this Memorial Day? Tweet to ReMIND is a celebration of support for the United States service men and women created by the Bob Woodruff Foundation’s ReMIND.org. Through the power of the social web, Tweet to ReMIND aims to raise $1.65 million by Memorial Day, May 25, 2009. According to Remind.org 1.65 million U.S. service members have been deployed to Afghanistan and Iraq since 9/11. More than 35,000 service members have been physically wounded. It is estimated that more than 320,000 have sustained traumatic brain injuries and more than 300,000 have psychological wounds. 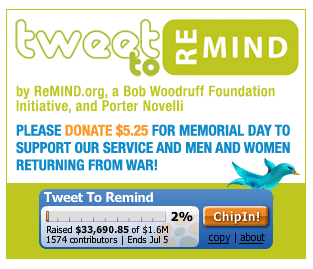 If you use Twitter, ReMIND.org asks tweeters to donate $1 for each tweet they send during the Tweet to ReMIND event on Memorial Day weekend. Tweets for Tweet to ReMIND must include the hashtag #tweettoremind. In honor of Memorial Day (5/25) this year, the organization is also asking that you consider a donation of $5.25 or more to support our troops. The 1.65 million dollar-goal symbolizes 1 dollar for every soldier who has served since 9/11. REMIND.org is a public education movement of the Bob Woodruff Foundation that informs Americans about the needs of injured service members, veterans and their families as they reintegrate into their communities. Read more at http://tweettoremind.org/ . Click on the “chip in” button to donate. Check out Remind.org: “Support our Troops” is no longer a slogan. It’s an action.